ESCON wants to acknowledge students' dedication to research and the quality of their work. Graduate students are encouraged to apply for the Best Paper Award. 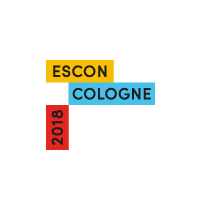 The Best Paper Award winner will be invited to present his or her paper in a plenary session at ESCON 2018 in Cologne. You are a graduate student currently or have been awarded your doctoral degree in 2018. You are the first author of the submitted paper. You provide an extended abstract of the paper (about 800 words), including a short introduction, description of the methods and results (including statistics), and a brief discussion. The steering committee will select participants for the meeting. The steering committee will evaluate the extended abstracts of accepted participants who applied for the award. A subset of applicants (top 3 to top 5 submissions) will be given 6 weeks to submit a full paper; one of those will be selected for the Best Paper Award. To be considered, the paper needs neither to be published nor submitted for publication. → Apply for the Best Paper Award in the submission process.